When you insert your new cartridge, you want to make sure it is fully locked into the designated slot. Listen for a clicking sound and pull on the cartridge lightly to make sure it is securely locked in. Did you remove the shipping seal? There is a shipping seal on every new cartridge, whether it is purchased from a third party vendor or the original manufacturer of the printer. This seal prevents the ink or toner from leaking out of the cartridge during shipping. Removing the seal is as simple as pulling the tab at one end of the cartridge and pulling out the long piece of material. In some cases, there may still be a part of the seal attached to the cartridge. Also, be sure to completely remove all other packing material. Are the important components clean? For laser printers, you must keep the imaging drum and fuser assembly as clean as possible. Almost any part can be wiped down with a towel, which will eliminate dust and toner particles that will scratch the surface and cause lines on prints. Inkjet printers use a nozzle technology, so it is important to keep the nozzles clean. Most printers have an internal cleaning system, but you want to make sure the nozzles are unclogged so the ink can be ejected at the right size and amount. You can often manually run a nozzle cleaning process from the driver software or the unit’s control panel. How old is your cartridge? Cartridges do have a lifespan of a couple years and can go bad if kept on the shelf for too long. The ink could dry up or the toner could get moist and clump. If you buy cartridges in bulk, make sure you are rotating the oldest ones to the front so you can avoid potential expiration. Have you done a cold start? Often, the printer memory is not reading the new cartridge chip because it is remembering the old one. To clear the memory, you must perform a cold start, which will allow your cartridge to be recognized if the memory is the issue. 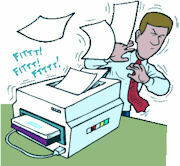 The bottom line is that there are a number of reasons your replacement cartridge might not be working in your printer. It is good to review this checklist to eliminate some of the most common issues. If the problem persists, call the manufacturer’s support line for more detailed troubleshooting techniques.